The share of total expenditure by the Central and the State governments taken together in India is around 27 per cent of GDP. In other words, more or less 27 per cent of money value of currently produced final goods and services within a year are produced for or purchased by the government of India. This means that the participation of government in aggregate level of activity in India is only slightly above one-fourth as compared to that to be more than fifty per cent in Euro area. It is a matter of common sense to understand that the governments with 25 per cent presence in the economy would not be comparable with governments with more than 50 per cent participation in the level of activity – larger governments are normally expected to be more important, powerful and capable on an average. As far as the World Economic Outlook database of International Monetary Fund (IMF) for the years 2010-2012 is concerned, the average size of governments in advanced economies has been 43 per cent of GDP, in European Union 49 per cent, in Latin America and Caribbean 34 per cent, in Middle East and North Africa 32 per cent and in Sub-Saharan Africa 30 per cent of GDP. The developing Asia including India has the lowest size of the government with only 24 per cent of GDP. Out of 189 countries, for which data is available, India ranks 125thvis-à-vis the government expenditure to GDP ratio. Clearly, for stronger and more effective government, we must try to step up our government expenditure as proportion to GDP in India. There are two ways to finance the government expenditures: a) by mobilizing revenue (mainly by taxation) and b) by incurring deficits (financed mainly by borrowing from the domestic financial market in Indian context). The combined fiscal deficit as percentage of GDP is not less in India when compared to that in most of the other countries around the World. Even if the fiscal deficit goes up by 1-2 percentage points of GDP, there is no harm. However, our main problem lies in the arena of revenue mobilization. India ranks 163rd out of total 189 countries vis-à-vis revenue collection of government as proportion to GDP. The average revenue GDP ratio of combined (Centre and States) government during 2010-2013 has been only 19 per cent on an average in India. This ratio has been 46 per cent in Euro area, 36 per cent on an average in the advanced countries, 37 per cent in Middle East and North Africa, 31 per cent in Latin America and Caribbean and 27 per cent even in the Sub-Saharan Africa during the same time period. Even in Developing Asia, this ratio has been more than 21 per cent according to the World Economic Outlook database of IMF. As far as our Indian Public Finance database of Ministry of Finance is concerned, the combined tax revenue as proportion to GDP stands slightly higher than 16 per cent on an average during 2009-10 to 2011-12 (Revised Estimate). The rest 3 per cent is combined non-tax revenue. Given limited possibilities of non-tax revenue mobilization, it is obvious that, without significant improvement in tax-GDP ratio, it is not possible to improve the presence of government in the economy substantially. In 3rd Century BC, Kautilya apparently suggested in his Arthashastra that the tax-rate of one-sixth (i.e. 16.7 per cent) is the key tax-rate applicable to domestic trade and economic activities (Reference: On the Manu-Kautilya norms of taxation: An interpretation using Laffer curve analytics by D.K.Srivastava; NIPFP working paper 172, 1999). If we look at the direct tax revenue of the Central government (the bottom green panel) as proportion to GDP during last 12 years, we see that there has been significant improvement particularly during high growth period of 2002-03 to 2007-08 from 3.1 per cent to 6.4 per cent of GDP. Then it stagnated at around 5.6 per cent of GDP. However, profit as percentage of net value added in organised manufacturing in India also increased from 24 per cent in 2001-02 to 62 per cent in 2007-08 and then stagnated at around 56 per cent of net value added (Source: Annual Survey of Industries). Clearly, profitability increased at a faster rate than increase in direct taxes on income of the rich and profit of the corporates. 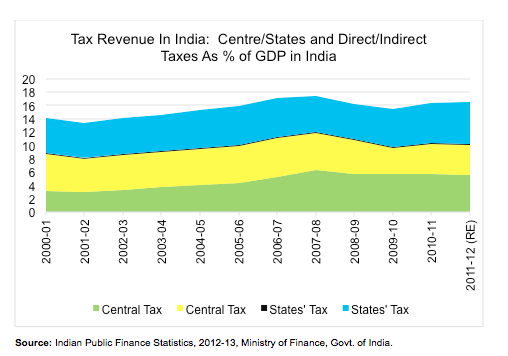 The indirect tax revenue of Central government has come down as proportion of GDP following the financial crisis of US in 2008 primarily due to excise duty cuts to revive the economy. The direct tax revenue of States are negligible and indirect own tax revenue of the States remained more or less constant as proportion to GDP during the last decade. 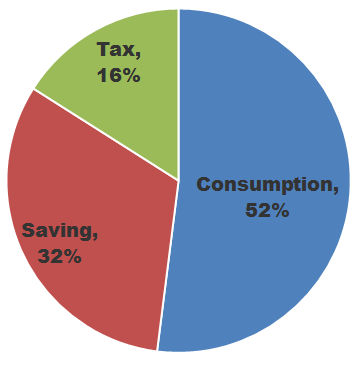 In 1989-90, the tax-GDP ratio was 15.5 per cent in India. The tax-GDP ratio came down to less than 13 per cent in 1998-99 mainly due to the reduction in customs duty as part of the so called ‘structural adjustment’ programme. Then the ratio improved continuously and crossed the 17 per cent mark (read Kautilya-rekha) for the first time in the history of independent India in 2006-07 and 2007-08. Then it came down to 15.5 per cent again during 2009-10 and after some recovery it has reached 16.5 per cent according to the revised estimate of 2011-12. During this high growth period, when profit rate as proportion of net value added in organised manufacturing became more than 50 per cent from less than 25 per cent, the profit tax rate has been actually reduced from 35.88 per cent to 32.5 per cent between 2004-05 and 2011-12. The effective tax rates have always been much lower than the statutory rates and big companies with more than Rs.100 crore profit paid taxes at the lowest effective rate (Reference: Revenue foregone statement of union budget of various years). Even if the same corporate tax rate of 35.88 per cent would have prevailed and the tax would have been collected at that rate, we would have got more than 2 per cent of GDP amount of extra revenue (see table:1 below) every year. The above table (Table:2) tells us that we could have touched 25 per cent mark i.e. one fourth of GDP during 2007-08 and 2008-09 rather than struggling to cross even the Kautilya-rekha. Some people have argued that without this kind of tax expenditures or indirect subsidies, the profitability or the rate of growth would not have been that high, which in turn, may have had affected the revenue negatively. Even if we believe in this argument, that explains only the tip of the iceberg. Even if we allow for reduction in direct tax rates, direct tax revenue of the Central government should have been higher by 1.5-2 per cent of GDP. 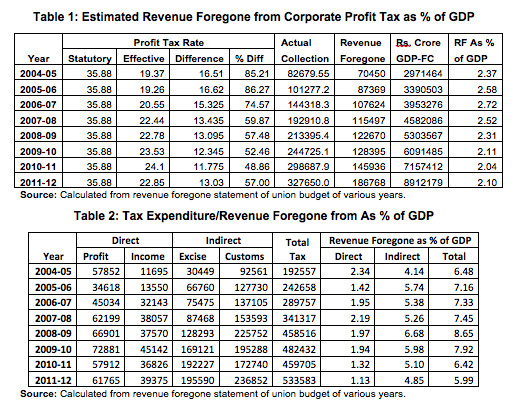 Including direct taxes and indirect taxes, the revenue of Central government would have been higher by 6-8.5 per cent of GDP (See the last column of Table:2). Given present level of fiscal deficit, the government expenditure in India could have easily become comparable with that in Latin America and Caribbean and it could have crossed at least Middle-East, North Africa and Sub-Saharan African averages. Given political will, the government could have easily stepped up health and education spending to 3 and 6 per cent of GDP respectively as per the promises made by the incumbent UPA Government in National Common Minimum Programme (NCMP). But, we missed the bus and got stuck within the vicious Kautilya-rekha. Surajit Das is an Assistant Professor in JNU.